Well, it’s been a few weeks, so I thought I’d update you on my running progress. And share a few stats, because I love numbers… and I love that my little Runkeeper app keeps them and motivates me! ran a total of 68,7km! 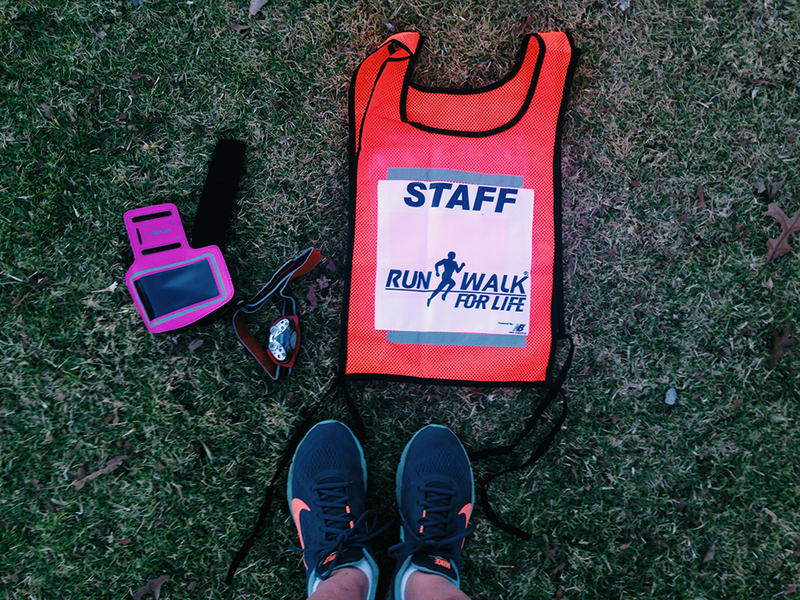 ran my first 10km race and blogged about it! ran my fastest 5km last week at a pace of 6:47 min/km! skipped only one RWFL session because I needed to rest before the race. How awesome am I? 🙂 I’m very pleased with myself. If you’re wondering a road leader helps other people on the road with directions etc, and makes sure that everyone is back safely… basically. And nicely make sure that people are running and walking on the right side of the road etc so they don’t get run over. The other thing that makes me visible, and that I’m finding quite indispensable during my evening runs, is the little head lamp that’s on the grass between the vest and my arm holder for my phone. I’m really struggling to wear it on my head though. The walkers at RWFL wear them around their necks, but that doesn’t work when you run… clearly because of the bouncing. So I wear it on my other arm pointed towards the ground. It seems to work for me like that. If you’re wondering… I got it from Cape Union Mart, they have a huge range of headlamps. One day, I’ll hopefully get rid of the phone strap… I’m dying to get a running watch! I’m finding that the running apps chow my battery, and I have to make sure it’s charged properly before I run. It’s really not ideal to run longer distances with a phone… not just for safety reasons. If you’re wondering about my next race. It was going to be this weekend, but the kids have a fun walk at school… so I’m going to do the Northgate race at the end of the month. Not that I’m complaining too much… the weather forecast for Saturday morning looks abysmal!! I will be running though, I’m up to 6km on the road from Saturday! And I’ll be dressed warmly for it… I have a buff for my head, and long-sleeved running shirt with reflective strips (which are most incredible to wear actually if you get the right type), and long running pants… I think I’m set for running in the freeze! I have been asked about where I get clothes from that are reflective and appropriate for running… think I’ll blog about that in a few days actually. Well done!! I’m on 8km now, once or twice a week, still on my own, around my neighbourhood. I’m thinking more and more seriously about joining a club. I’m also seriously considering going in the late afternoons rather than early mornings. And yes, the number one item on any of my current wishlists is a running watch. I have a little pedometer/music player but it’s calibration is iffy… Still, it’ll do for a while yet. 8km is awesome! I’ll be there soon. I’m the only one running on the road in the club still… there are a lot of walkers though. I’m waiting for the runners to finish their laps on the field. I wish I lived closer to you – then you’d have at least one runner who’d be able to join you pretty soon! My biggest issue is that the clubs I can afford are far from me and the ones closer to home are really expensive… I’ll keep researching though. There’s bound to be a group I can gel with in an area near me. Very impressive progress, well done! Makes me feel quite excited about getting back into it at the end of the year. Even though right now I am quite happy to be lazy and pregnant during the cape storms! Thanks for blogging about your progress…. truly is motivation for me as I have just started! Loving it! chasing time, trying NOT to think of ’round n round the mulberry bush’ while still on the field 🙁 Hopefully soon we can run together! You must be feeling fabulous.